Northcott ‘Shore Thing’ 22070-42, designed by Lynnea Washburn. Distributed by Lloyd Curzon Textiles. Riley Blake Designs ‘Pirate’s Life’ Seas the Day C7355-BLUE, designed by Shawn Wallace. Distributed by Millhouse Collections. 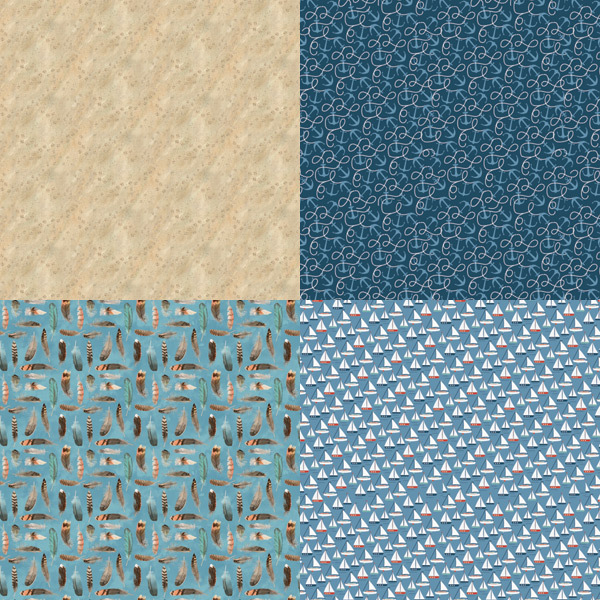 Robert Kaufman Fabrics ‘Marmalade Dreams’ RK1790064 (Azure colourway), designed by Valori Wells. Distributed by Two Green Zebras. Riley Blake Designs ‘By The Sea’ Boat C5701-WHITE, designed by Dani Mogstad for My Mind’s Eye. Distributed by Millhouse Collections. Northcott ‘Shore Thing’ 22076-12, designed by Lynnea Washburn. Distributed by Lloyd Curzon Textiles. Riley Blake Designs ‘By The Sea’ Anchor C5702-NAVY, designed by Dani Mogstad for My Mind’s Eye. Distributed by Millhouse Collections. Northcott ‘Shore Thing’ 22071-42, designed by Lynnea Washburn. Distributed by Lloyd Curzon Textiles. 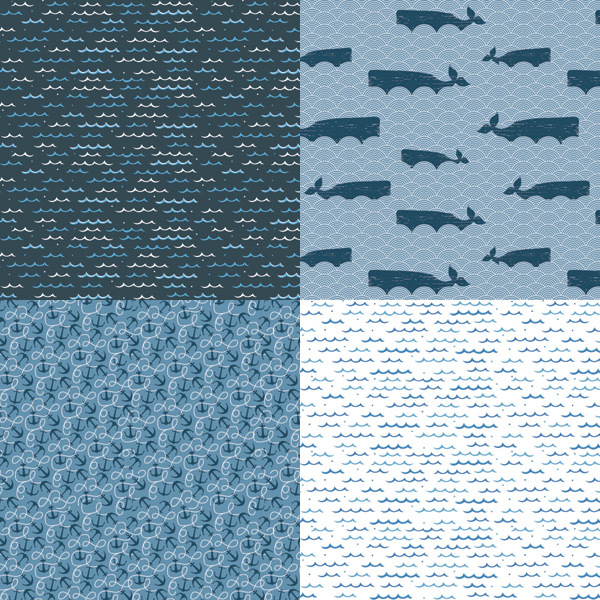 Riley Blake Designs ‘By The Sea’ Boat C5701-BLUE, designed by Dani Mogstad for My Mind’s Eye. Distributed by Millhouse Collections. Riley Blake Designs ‘By The Sea’ Main C5700-TEAL, designed by Dani Mogstad for My Mind’s Eye. Distributed by Millhouse Collections. Northcott ‘Shore Thing’ 22072-11, designed by Lynnea Washburn. Distributed by Lloyd Curzon Textiles. Northcott ‘Shore Thing’ 22074-42, designed by Lynnea Washburn. Distributed by Lloyd Curzon Textiles. Northcott ‘Shore Thing’ 22077-11, designed by Lynnea Washburn. Distributed by Lloyd Curzon Textiles. Riley Blake Designs ‘Pirate’s Life’ Seas the Day C7355-GRAY, designed by Shawn Wallace. Distributed by Millhouse Collections. 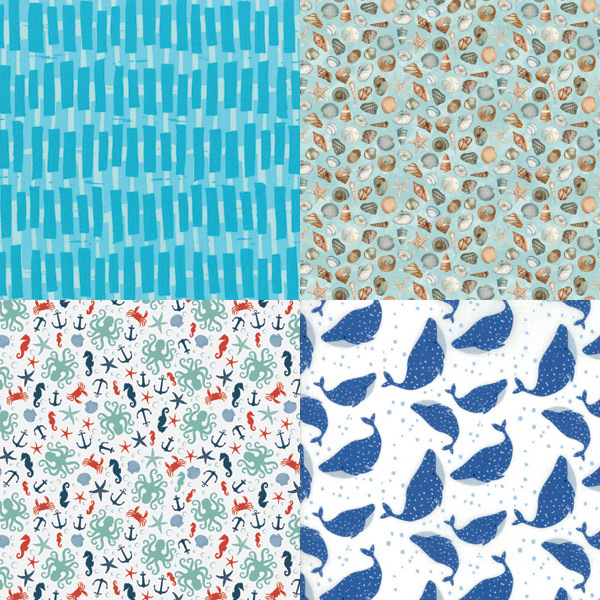 Riley Blake Designs ‘By The Sea’ Main C5700-BLUE, designed by Dani Mogstad for My Mind’s Eye. Distributed by Millhouse Collections. Riley Blake Designs ‘By The Sea’ Anchor C5702-BLUE, designed by Dani Mogstad for My Mind’s Eye. Distributed by Millhouse Collections. Riley Blake Designs ‘Pirate’s Life’ Seas the Day C7355-WHITE, designed by Shawn Wallace. Distributed by Millhouse Collections. Robert Kaufman Fabrics ‘Marmalade Dreams’ RK1790264 (Azure colourway), designed by Valori Wells. Distributed by Two Green Zebras. Northcott ‘Shore Thing’ 22072-42, designed by Lynnea Washburn. Distributed by Lloyd Curzon Textiles. 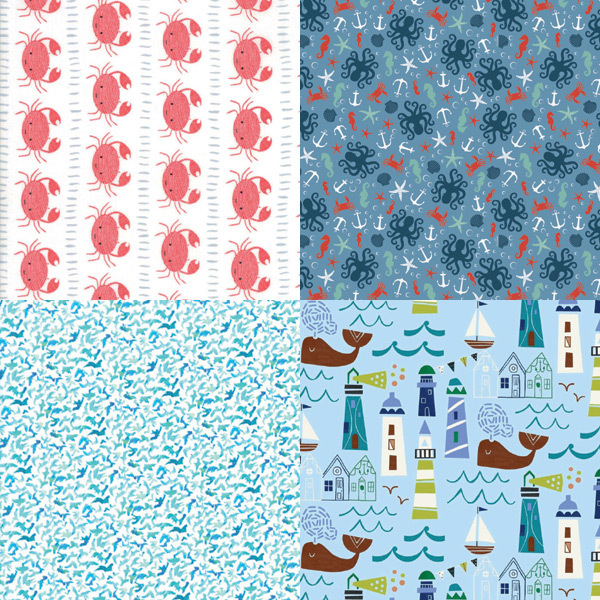 Riley Blake Designs ‘By The Sea’ Scatter C5703-WHITE, designed by Dani Mogstad for My Mind’s Eye. Distributed by Millhouse Collections. Moda Fabrics ‘Ahoy’ 48241-11, designed by Gingiber. Distributed by PK Fabrics. Northcott ‘Shore Thing’ 22075-42, designed by Lynnea Washburn. Distributed by Lloyd Curzon Textiles. 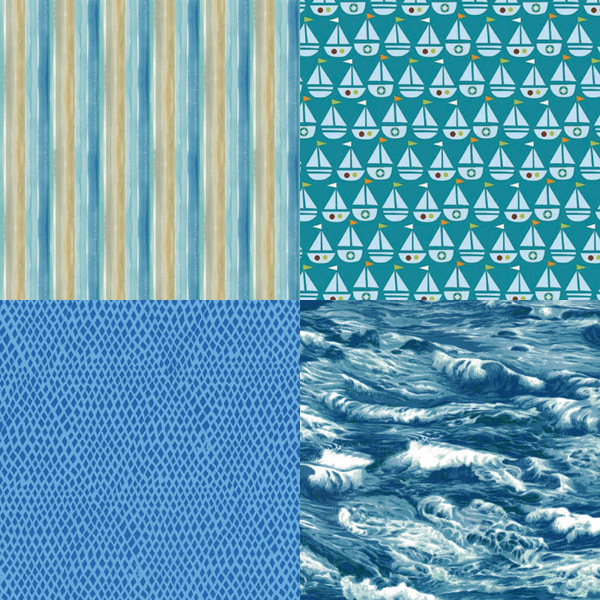 Windham Fabrics ‘Seaside’ D426946, designed by Jill McDonald. Distributed by Leutenegger. 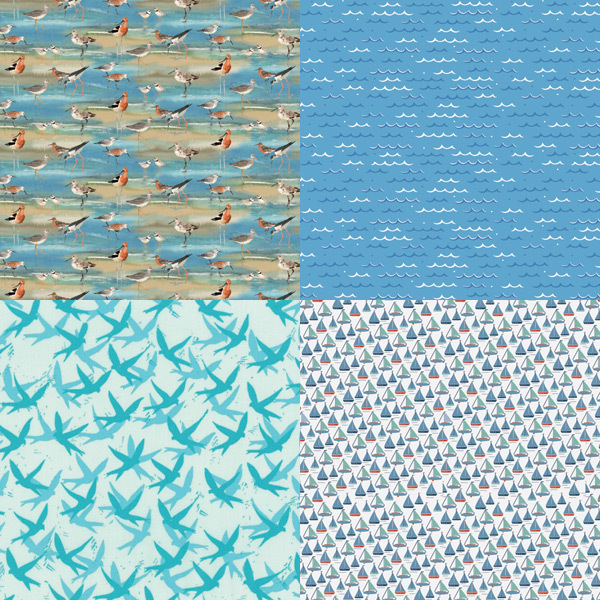 Robert Kaufman Fabrics ‘Marmalade Dreams’ RK1790182 (Blue Jay colourway), designed by Valori Wells. Distributed by Two Green Zebras. Nutex Wholesalers ‘Novelties’ Sea 86050, Col. 1. Distributed by Nutex Wholesalers. Moda Fabrics ‘Ahoy’ 48243-11, designed by Gingiber. Distributed by PK Fabrics. 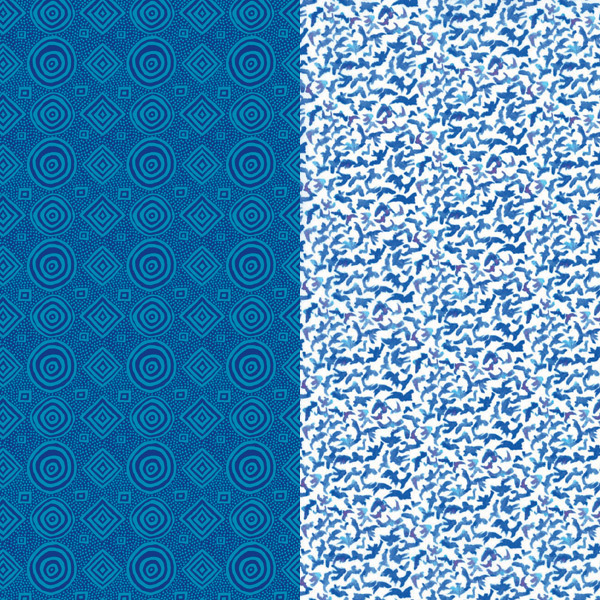 Riley Blake Designs ‘By The Sea’ Scatter C5703-BLUE, designed by Dani Mogstad for My Mind’s Eye. Distributed by Millhouse Collections. Liberty Fabrics ‘Castaway’ Flock A (137cm wide). Distributed and sold by The Strawberry Thief. 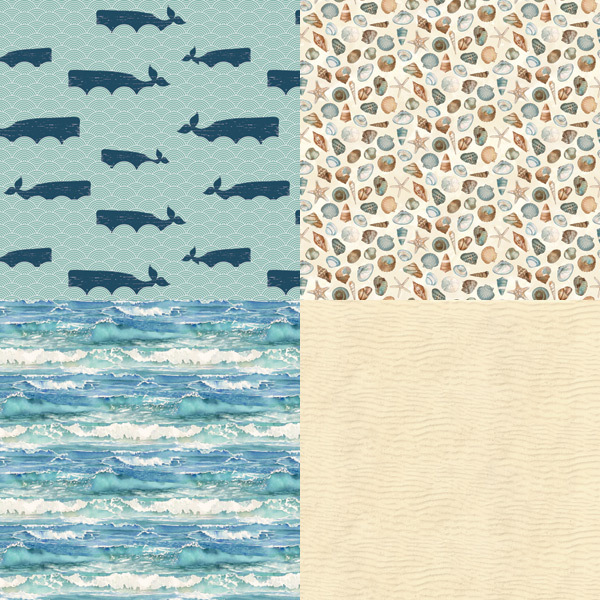 Windham Fabrics ‘Seaside’ D426922, designed by Jill McDonald. Distributed by Leutenegger. FreeSpirit ‘Kaffe Fassett Collective – Spring 2018’ Good Vibrations – Teal PWBM065.TEALX, designed by Brandon Mably. Distributed by XLN Fabrics. Liberty Fabrics ‘Castaway’ Flock C (137cm wide). Distributed and sold by The Strawberry Thief. – Leutenegger: (02) 8046 4100, cservice@leutenegger.com.au, www.leutenegger.com.au. – Lloyd Curzon Textiles: (08) 8362 2451, admin@lcurzon.com.au, www.lcurzon.com.au. – Millhouse Collections: (07) 5351 1400, sales@millhousecollections.com, www.millhousecollections.com. – Nutex Wholesalers: (New Zealand) +64 9 846 6366, craft@nutex.co.nz, www.nutex.co.nz. – PK Fabrics: (02) 9557 2022, sales@pkfabrics.com.au, www.pkfabrics.com.au. – The Strawberry Thief: robyn@thestrawberrythief.com.au, www.thestrawberrythief.com.au. – Two Green Zebras: (02) 9553 7201, sales@twogreenzebras.com, www.twogreenzebras.com. – XLN Fabrics: (02) 9621 3066, info@xln.com.au, www.xln.com.au.